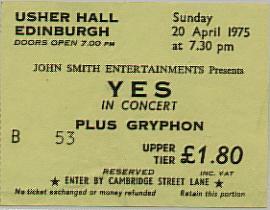 In Edinburgh '75 Yesfans rolled up for an 8am start at the Playhouse, only to find the theatre double-booked with "Bingo". (a popular "sport" for elderly ladies in UK) The Bingo ladies won the day, and the Yesfans were told to come back at Midnight. The concert actually got underway around 1am - 5 hours late.